AN ANTI-ABORTION film that major Hollywood studios refused to fund was screened at the White House last night, amid jubilation from conservatives who believe its success will act as a wake-up call to liberal-minded movie executives. "Conservatives had given up on Hollywood," said Phelim McAleer, the Irish producer of the film. "People who saw our film told us they hadn't gone to the cinema since 'The Sound of Music'. Hollywood was insulting them. They were tired of having their beliefs ridiculed. The success of our film is absolutely part of a growing trend." The White House screening came the day after Ohio's governor signed a law banning abortion after six weeks - the fifth state to do so. The states' actions have all been blocked by the courts, but pro-choice activists say that having Donald Trump and vice president Mike Pence in the White House, plus conservative Brett Kavanaugh on the Supreme Court has emboldened anti-abortion activists. Mr McAleer's film, 'Gosnell', tells the true story of Philadelphia doctor Kermit Gosnell, who ran an abortion clinic. He was convicted of murder in 2013 after three of the infants were born alive during botched procedures. He was also found guilty of involuntary manslaughter after a woman died during a procedure. Gosnell, now 78, is serving life in prison. "I was making a fracking documentary in Pennsylvania at the time, and came across the 'Gosnell' trial in a local newspaper," Mr McAleer, a former investigative journalist-turned documentary maker, told 'The Daily Telegraph'. "There were incredible pictures, it was absolutely horrific - the most shocking evidence I had ever seen. But what was more surprising was that it was getting very little coverage." Along with his wife, Ann McElhinney, Mr McAleer wrote a book about the case, which forms the basis of the film. But producing a picture with a strong anti-abortion message was a tough task in Hollywood. The couple turned to crowdfunding, raising $2.3m (€2m) from 30,000 people over 45 days in what was, at the time, the largest ever haul. Casting the movie was no easier as actors were reluctant to be associated with its controversial message. In the end Dean Cain, star of TV's 'Superman', accepted the role - Mr McAleer said "he just loved the truth". The film was screened in 650 cinemas and took more than $4m ($3.5m). The success of 'Gosnell' has been followed by that of another film, 'Unplanned', based on the memoir of a former director of a US family planning service who became an anti-abortion activist. The film, released on March 29, exceeded box office expectations on its opening weekend, earning more than $6m ($5.3m) and recouping its budget from just 1,100 screens. The film was a financial success despite companies holding the rights to songs they had hoped to use turning them down and TV networks refusing to screen the trailer. The star of the film, Ashley Bratcher, who plays Abby Johnson, has also struggled to get television interviews outside right-leaning Fox News and the Christian Broadcasting Network. Meanwhile, Donald Trump has admitted he almost gave his daughter Ivanka Trump a job with the World Bank because "she's very good with numbers". "She's a natural diplomat," the US president told 'The Atlantic'. "She would've been great at the United Nations, as an example." 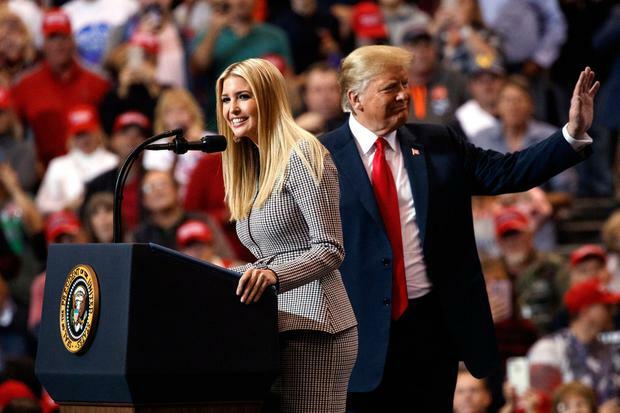 He decided not to proceed because if he had nominated his daughter (37) "they'd say nepotism, when it would've had nothing to do with nepotism. But she would've been incredible". "I even thought of Ivanka for the World Bank," Mr Trump said. "She would've been great at that because she's very good with numbers. "She's got a great calmness. I've seen her under tremendous stress and pressure. "She reacts very well - that's usually a genetic thing, but it's one of those things, nevertheless."